Merry Christmas, Feliz Navidad, Joyeux Noel, Buon Natale, etc everyone!!! I’ve been pretty busy since our last update, getting everyone moved out of our Via Giusti apartment and moving into my new Borgo Oggnisanti apartment, traveling to various countries (or country as is the case), and making sure there’s food on sale during Christmas Eve day. You never know in a religious country like Italy. In any case, I’m spending Christmas away from the family here in Florence, but my cousin Danielle has come out for her winter break. We’re taking the country by storm (and eating more than our weight in delicious food of course). Before I get to Christmas celebrations, I should probably give you a run-down on everything that’s happened in the past few weeks. 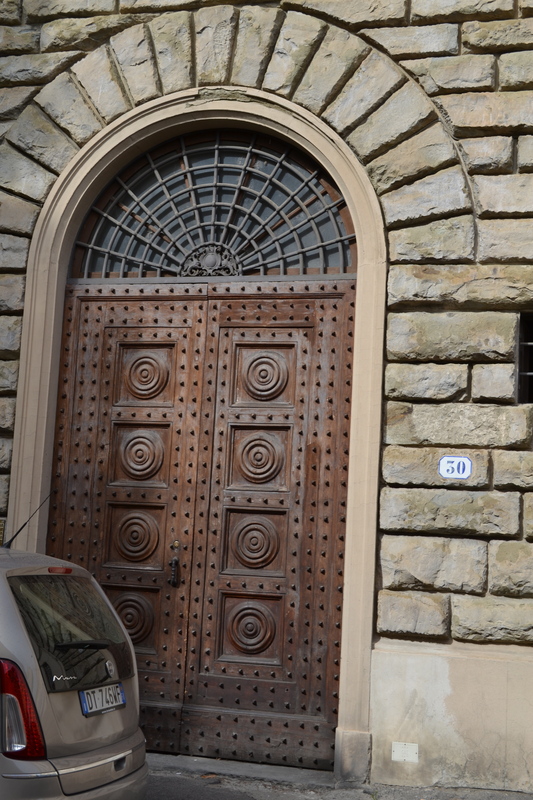 The move-out of the fall semester Palazzo Ruccelai students was something of a nightmare. We had to get the apartment cleaned up, furniture returned to original rooms, and garbage removed in entirety. Nightmare. Not to mention the tension between housemates leading up to the actual date. I swear, girls are vicious. I realize that the last time I wrote about my roommates, I got in “trouble” with school administration (because heaven forbid I tell the truth on an obscure blog easily lost in the catacombs of the Internets), but I’m sincerely glad I’m not living in that environment anymore. Passive aggressive behavior pisses me off. Problems should be addressed promptly and with honesty, but apparently this is beyond certain persons. Never mind the fact that we’re unlikely to ever see each other again, some students not even attending the same universities as each other. Even the girls who attend ASU are unlikely to ever see me, unless they’re interested in 400-level English lit classes (which they aren’t) or have a sudden urge to grace Barrett with their presences. It’s astonishing, the growth rate of maturity. As in, stagnation seems disgustingly prominent. Anyway, with the leaving of my former roommates came the arrival of Danielle and our trip to Reit im Winkl. We were set up for our very first White Christmas in Pension Louise with Rudi, Kornelia, Alexandra, and Mikel. Behold the view from the second floor! Very Winter-Wonderland isn’t it? This was my first time I’d been in snow, and man, was it cold! Of course, with the proper attire, there wasn’t much of a problem, but I don’t think my face has ever been quite so freezing. Wearing a ski mask all the time wasn’t exactly prudent. Not to mention it’s creepy. Rudi and Kornelia stuffed us stupid. Italian food culture and German food culture are drastically different, the latter more like the American mentality of “eat a lot.” That being said, after eating relatively balanced meals here in Florence, going to Germany and gorging on heavy comfort foods like potatoes, goulasch, schnitzel, and hot wine probably dropped about ten pounds on every part of my body. I can’t even bring myself to step on a scale. Ugh, I’m looking at a new pants size, I know it. You'd get fat if you ate stuff like this, too. This is Kaiserschmarrn. Coming back to Florence meant getting ready for our meagre Christmas away from family and friends. We had no Christmas tree aside from the six-inch tall decoration sitting on our kitchen table, but luckily I’d made a reservation at a cute, Tuscan restaurant called “Acqua al 2” for actual Christmas dinner. Unfortunately, we had to figure out what to do with ourselves on Christmas Eve. With the heating out in the apartment (and still not functioning btw), we were so cold that we didn’t even bother with a conventional dinner and just made soup from a packet. I slept hard that night. Travel in any form is tiring, and even though the flight from Germany only took a collective three hours, I was ready to sleep well into the next day. Christmas Day was as satisfying as it could be. Sitting and opening presents by ourselves at noon couldn’t really compare to our home traditions. Apparently my brother woke up at 4AM raring to go and my parents finally obliged him at 7:30 before going to our neighbor’s place for Christmas breakfast. I missed that. I’m certainly not sorry to be here, but I’m glad for the advancement of technology. FaceTime has never been used for such a long period of time. I think my parents called me four times that day and Danielle and I definitely presided over whole-family-clan-Christmas-activities for nearly four hours. It was almost like being home again. This wasn’t my first time missing a big family gathering. I spent the Easter of my high school junior year in Japan, and I can say with certainty that I might miss a few more holidays in the coming years. Maybe Apple will invent hologram technology by then? Dinner at Acqua al 2 was splendid. I’d only been there with my friend Daniel once before, but I’m glad we went again. Danielle and I indulged in three course meals, but we skipped dessert. I couldn’t find room anywhere to fit it! I don’t have any pictures for you. The lighting is kept low in the dining rooms, and taking photos with my camera at 1/2 second or even slower is incredibly difficult without a tripod. You’ll have to do with my description. I started with a carrot salad (just carrots), primi piatti was farfalline (bowtie) con zucca (pumpkin), which was to die for, primi secondi was fillet mignon with reduction of balsamic vinegar. Previously, I’d had fillet mignon with blueberry sauce, and I can’t make a comparison of the two. Both were absolutely delicious. I’ll just have to have them again. Oh well. Danielle and I have also done a bit of post-Christmas shopping. We hit H&M with all the combined might of our credit cards (not really) and picked up a few things for New Years, which we’re spending in Venice this year. I bought a cute little black dress, a champagne scarf, and a new pair of high heels. I won’t be going shopping for a while. It’s so hard to resist, though! Fashion’s so accesible here. Now that the Holiday craze is settling down a bit, we’re not doing much by means of site-seeing. We’ll hopefully be able to drag ourselves out of bed to climb the Duomo tomorrow. Hopefully. We haven’t been doing a good job of getting up early. I don’t have the best track record for being an early riser, but this is just ridiculous. Hope you enjoy these Christmas lights! I definitely do. This may take a while . . . Okay, the long-awaited discourse on my fall break: The Best of the East. Daniel and I decided to take advantage of tour-company, Euroadventures, during our fall break to explore some countries neither of us had encountered before. The trip spanned Austria, Slovakia, Poland, Hungary, and the Czech Republic in only 10 days, so we were definitely in for some fast-paced travel. Packing for this was definitely an issue. For one, I’ve never really been in a “winter” country. You know, where it snows. It snows in Eastern Europe. Luckily not while I was there, otherwise I wouldn’t be writing this. My fingers would’ve fallen off. Anyway, while it never snowed, temperatures flirted with freezing, so thanks Mom for that down jacket. I used it every day. Vienna, Austria was our first stop and it’s the one I remember least. I’d heard prior that it was a very beautiful city with plenty of culture and opera and ballet and beautiful museums. The people weren’t terribly friendly, though. Then again, we were 40+ screaming American college students. It’s hard to find anyone anywhere that would look at us with anything other than disdain. A wild pack of students on break is often akin to a manic tribe of monkeys, and students abroad are one hell of a monkey mania. Once we managed to break off of the group, though, we were able to m eet some pretty cool people, namely the “Clique.” We’ll get to that. We were only there for a day and a night (we really hit the ground running for this trip), so we didn’t have much time to see anything outside of the walking tours we were provided. Daniel and I became friends with two girls from the group, Monica and Tara, both studying in Florence though not at Palazzo Ruccelai. Together we had lunch at a tiny hole-in-the-wall off the main strip near the cathedral and then hunted down the Belvedere Palace to see the art museum, mainly for the famous “The Kiss” by Gustav Klimt. Unfortunately photos weren’t allowed and I hadn’t thought to be sneaky about getting one. Sorry guys. It was beautiful though, very sparkly. What I remember best from Vienna is the food. You’ll find that’s a common theme for this trip. Food, food, food. I didn’t do much shopping, so photos really take up the majority of my memory cache. Vienna’s food was pretty familiar: bratwursts and potatoes and heavy gravies. Very homey food. Fashion is raging here in Italy right now with the start of Milan Fashion Week. Cities around the world are staging their own massive showcases of the latest moda, London prominently displaying bursts of color and vibrant sprays of feathers and fur, Milan parading the knit woolen parkas and high-heeled boots of winter time. This past weekend I was lucky enough to give Milan a bit of a run through, even though my friend Daniel and I really only had about five hours to do the city. Day started at 6:00AM. Despite waking up on weekdays at the usual 7:30, that 1.5 hour difference nearly killed me. The ways of the college student demand being at least conscious at 2AM, so I think I only had about four hours of sleep that day, maybe a little less. Regardless, the train ride from Florence to Milan took nearly four hours due to delays, so I got plenty of sleep in before we made it to the city. Daniel managed to sleep some, too, though I think I got the most of it. I’ve always been able to sleep well in moving vehicles. Save planes. Planes are weird. Daniel and I wandered into the high-end shopping district, completely aware that everything would be well above our practical price range. Try as I might, I could never justify buying a purse of any brand for more than 30€, and even that price is pushing it. When the Gucci and Prada bags are going for at least 300€ for a decent sized one, I’d rather buy that military-style trench I’ve been eyeing at Zara for the past couple of days… Hmm… Of course, looking at everything was fun, and we discovered that Gucci has made a foray into the realm of chocolate. The guard kicked us out before we managed to get a picture of the gourmet, “G”-stamped bars. I bet Milka tastes better. After a bit more trawling of the likes of Louis Vuitton and Swarovski, we stumbled upon a side alley that led to one of the many public fashion shows set up around the city. We managed to get some seats (but no goodie bags, since those were for the lucky ones who registered) and saw a showing for Paolo Casalini. Have no idea who he is, but his clothes were cute and as usual the models all looked the same but distantly gorgeous. The show lasted hardly twenty minutes. I’m not sure if that’s average length, since one can only design so many outfits before repeats start showing up on the runway, but it seemed as if we were walking away from the piazza just moments after we’d sat down to watch. Regardless, it was awesome and I now get to say that I’ve seen a fashion show in Milan during Fashion Week. Shortly after leaving the venue, Daniel and I stumbled upon a hole-in-the-wall bakery teeming with Italians, all squabbling for a place in line and shouting back and forth between each other, obviously regulars for the lunch rush. Not about to let an opportunity pass, we shoved our way inside and snagged ourselves some dessert calzone stuffed with peaches, almonds, and ammaretti. Didn’t think to take a picture, and they were gone by the time I remembered that I actually owned a camera. We had about an hour before we had to catch our train back to Florence, so we decided to head into the Duomo and get some photos with our newly fostered knowledge of the manual setting on our SLR cameras. The white spires cut starker lines than the generous curve of Florence’s domed cathedral, but it suits Milan’s sharp and modern splendor, though the inside looked like every other cathedral I’ve ever seen. Having seen many cathedrals, I’m still awed by the magnificent architecture and the sheer magnitude of their age. These things have been standing for hundreds of years, some not even fully completed yet, and previously without the use of mechanical cranes or other modern technologies. I learned recently that the Florentine Duomo’s dome was built prior to its being placed on the actual church. I can’t imagine how they could have done it. 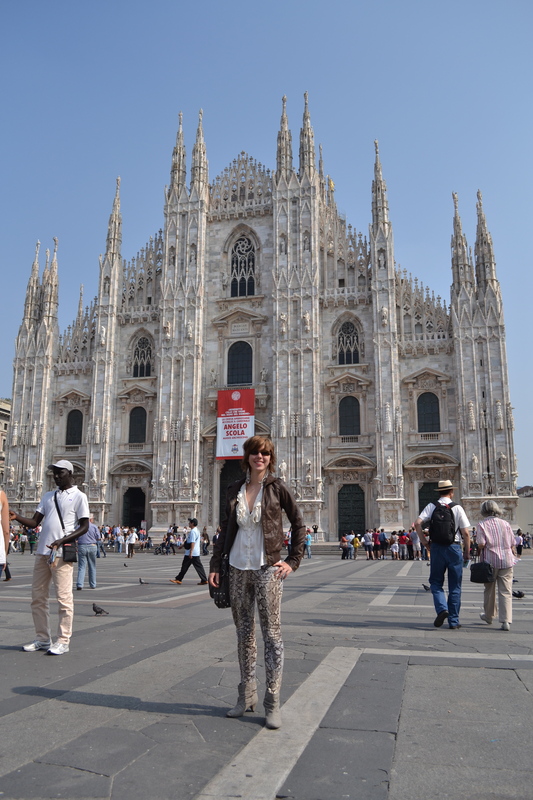 Milan was an experience, and I’m glad I went even for such a short time. I want to go back to see the Last Supper fresco, but I’ve got a while left yet. I can’t believe that I haven’t even been here in Florence for a month yet. Granted, it’s been a while since being in the continental US, but I still feel like I just got here. The workload isn’t heavy, so it doesn’t really feel like school, just an extended vacation with a bit of side-study. We’ll see how things pick up around midterms. I recently discovered George R.R. Martin’s “A Song of Fire and Ice” series, including the HBO adaptation of “Game of Thrones,” and I’m hoping that will keep me occupied for a while. It’s been so long since I’ve read a good book series! Food Paper Topic: Blood Wars Paid in Chocolate AND Modern Science and Cooking. I’ve been given leave to write them both, though only one will count for credit. My prof said he’d be a bit more interested in the Chocolate one, which I’m pretty okay with, seeing as I have the International Chocolate Festival in Perugia coming up in a few weeks and my subscription to Harvard’s YouTube channel just popped up a lecture on “The Many Faces of Chocolate.” Signs? Oh, yes. So I’ve been in Florence since Wednesday, and I can’t even describe how busy I’ve been. Even at ASU, orientation didn’t take three days. Then again, we spoke the same language in Arizona (if not the same slang), usually ate the same food, and couldn’t get arrested for making a bunch of noise in our dorm rooms at three o’clock in the morning. Florence is a big cultural shift from college life at Barrett. I expected no less, but I think my roommates are still reeling from the differences. I can’t say how often I hear the word “America” or “American.” They miss home. Rather, they miss the fixings of home. Orientation covered a lot more than I thought it would. Aside from the copious amounts of paperwork to fill out, we were introduced to all of the professors, administration, and locations for classes. We got our books, schedules, and signed up for some September extra-curricular activities. All in all, it seems a lot like school. Nothing’s terribly different, save for the fact that we’re in Florence. We have three day weekends with the promise of attendance the other four days of class. I’m looking forward to the routine of classes. Honestly, this floating around with no set plan is starting to get old. I’m not sure what to do with myself. Definitely glad that classes start tomorrow. My door on Via Giusti! Anyway, I’m living in Via Giuseppi Giusti, 30 for this semester with six other girls. They’re good fun, though a little more interested in the bottle than I am. I don’t think they’ve done a lot of traveling outside of the US, so I sometimes feel like I’m imposing my knowledge on them. I do mean well, but I can see how my interest in helping could be taken as condescending or patronizing. Not that it matters, I’m sure we’ll all know the city equally well by the time they leave. Oh, I’m the only student staying for the academic year, by the way. As a result, the entire administrative staff knows who I am. Awkward. Today was our first free day and I was the only one up at a reasonable hour. I decided to take a little stroll through the city, and since I had to buy an umbrella, it was a great opportunity to do a bit of shopping. Unfortunately, I hadn’t counted on it raining before I could get to a shop with a reasonably priced umbrella. 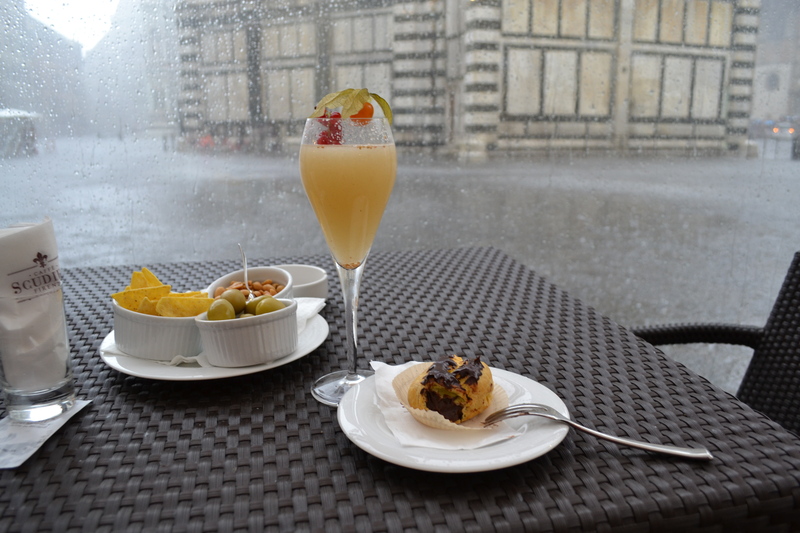 Luckily, though, I’d just ducked into a little cafe to have a drink and snack when the downpour started. I had a front-row seat to the Duomo’s piazza emptying as people scurried for cover under massive stone eaves and the awnings of pizzarias. A bellini and chocolate bigné and I was set. After the rain let up, I did a bit of shopping at Zara and H&M. I bought some perfume, my umbrella, a pair of black flats, and some nail polish to cover my horrendous fingernails. I’m flattered (and kind of embarrassed) to say that I got a lot of looks/whistles from various men, thereby disproving that only blonde ladies get catcalls here in Florence, but it definitely brightened the overcast day. Every girl could use a self-esteem boost in the form of a hot whistling Italian man. On the way home I went to the San Lorenzo marketplace, where all of the leather goods are sold, to pick up some wine toppers since the corks never seem to fit back into their bottles once we open them. I really hope they don’t break. We’ll see. If they do, I know the stall where I can get them cheap. Tomorrow classes start, and Palazzo Rucellai is a fair walk from Via Giusti. Add to that my first class starts at 9:30, and I have to be up freakin’ early. Ugh. My dad got a kick out of that, though. Back at ASU, I’ve made an effort to schedule my classes as close to noon as possible. I’m not a morning person at all. Anyway, class update on Tuesday after I’ve been to all five of them! Hope everyone’s having a good day. Bye!